“Me, I’m not French, I’m a worker”. 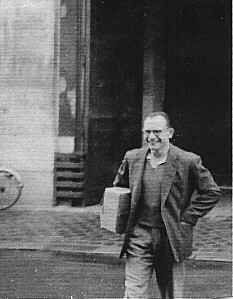 Pierre Morain, at the Lille tribunal, 1955. Pierre Morain was born in Paris and became a navvy. His combativity meant that he often lost a job. He gravitated towards the Federation Communiste Libertaire which he joined in summer 1954. He contributed articles on building workers and other subjects to the FCL paper Le Libertaire. He was deeply involved in anti-colonialist work. Daniel Guérin arranged contacts between the FCL and the Mouvement National Algérien (MNA) of Messali Hadj. They asked for a support committee to be set up in northern France. With this in mind Morain moved to Roubaix. He worked by day as a building worker and in the evening sold Le Libertaire in the Algerian cafés . He contributed several articles to the paper on the daily life of Algerians in Roubaix. He was arrested at Lille during a demonstration on May 1st 1955 when the police made an attempt to stop Algerians joining the May Day march. Five hours of fighting took place with Morain at the side of the Algerians. He was arrested on 29th May and subsequently charged, along with many Algerians, of having been involved in the reconstruction of an organisation forbidden and dissolved by the state, the MNA. He was imprisoned at Loos on 29th June. At first sentenced to five months, the heaviest sentence inflicted on those charged, he had his sentence increased to one year on appeal. It was the action of the defence committee launched in October and led by Jean Cassou, Daniel Guérin, Claude Dechezelles and Yves Bourdet who built up support among intellectuals and artists, including surrealists like Andre Breton. But it was the action of Albert Camus who highlighted the case in the national daily L’Express on 8th November 1955 and thus attracted public opinion when he wrote:” So far the protest has been limited to narrow sectors of public opinion. Morain has committed the double wrongs of being a worker and an anarchist”. Up until his premature death Camus stood by his connections with the anarchists and the MNA. Morain was the first Frenchman to be imprisoned in the anti-colonialist struggle. Whilst in prison he was written to by Suzanne Gouillardon, a teacher and FCL militant and they married after his release from jail at the end of March 1956. However Pierre remained under a charge of having threatened the “external security of the State”. In August 1957 he took part, as a member of a group of the FCL, in a plastic explosives attack on a Poujadist centre in Paris. The group had been infiltrated by an agent provocateur and Pierre returned to prison and then received a heavy fine. This was in the period of clandestinity when the FCL decided to go underground, this decision losing them some members who disagreed with this tactic. In conference on 22nd June 1958, a conference of the now loose network of ex-FCL militants decided to enter the Communist Party to carry out work and renamed itself Action Communiste. However this grouping hardly outlived that summer and nearly all its members entered an internal opposition inside the PCF, Voie Communiste. Morain joined the Party and the building section of Nievre, but was quickly expelled because of his views, despite the support of rank and file members. The Morains moved to Nevers in western France. When May 1968 burst forth in flower, Pierre Morain signed an Appeal with Fontenis on the 1st May, who was living nearby at Tours, to the ex-members of the FCL and to the Union des Groupes Anarchistes Communistes to attempt to set up a network. They travelled down from Nevers to the Larzac plateau in southern France to take part in all the mobilisations against the extension of the military base there in the 1970s. Local militants asked them, “Why don’t you come and live here”. In 1976 they moved permanently to Larzac. moving into an abandoned farm at Les Marres, which stood within the militarised zone. There they remained up to the time just before Pierre’s death, both having to be taken into medical care at that time. In 2000 Georges Fontenis held a meeting in Paris to launch his book Changer le Monde. Pierre Morain came all the way from the Larzac plateau to attend and recounted how he had been arrested at the demo in 1955. His hand on the shoulder of his old comrade, Fontenis began to cry as he remembered the huge fines, the constant State seizure of Le Libertaire, and the months inside that they had both served. He and Suzanne featured in the film Une Résistance Oubliée (A Forgotten Resistance) made by Daniel Goude and Guillaume Lenormant (2001). This recounts the repression that came down on the FCL, and includes interviews with the Morains, Line Caminade, Georges Fontenis, Paul Philippe and Guy Bourgeois. Over the course of the years, this inseparable couple took part in support for the Kanaks in New Caledonia, for the Polynesians against nuclear tests, for the Japanese against the extension of a military airport, in Palestinian solidarity work, and were involved in the activities of the Confederation Paysanne and the GM “Reapers”. Asked by a reporter from the daily Le Monde why they carried on at their age, Pierre replied “we do not want to put up with a society that has been imposed on us. And to fight alone has no outcome”. Their son Claude died earlier this year, in April at the age of fifty five. Pierre died on the 27th May 2013. At his funeral on the 30th, 200 people gathered, coming from the plateau and beyond. Line Caminade, another ex-member of the FCL, sent a message remembering the struggle in the 1950s. The extremely moving antimilitarist song Le Butte Rouge was sung, followed by Le Deserteur, written by Boris Vian. As the coffin was lowered into the grave, the Internationale was sung. Thanks for this short biography. Hello Nick, could you please mention that this necrology is based on an article published in "Alternative libertaire", summer 2013 ? Can you correct one thing ? Pierre Morain was never a member of FA nor OPB (it's a tale created by Wikipedia). He joined the FCL in summer 1954. Thanks ! Will do. Meant to put acknowledgement in but overlooked it! Will rectify now. Not completely based on the Alternative Libertaire article by the way. Actually, looking at the time scale I put this on libcom on 19th June 2013, Davranche, and your Morain obituary did not appear until the summer edition of Alternative Libertaire (July-August) so it was not based on that. That's right, but a little article was written on the 1st of june 2013. The information given by Militants-anarchistes.info is wrong.